2012 Ford Island Bridge Run 10K » Use Exciting in a sentence. 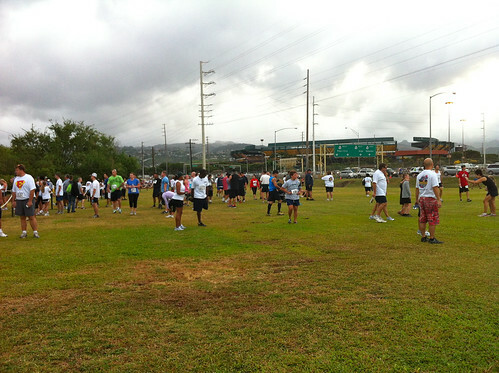 This morning, I participated in the Ford Island Bridge Run, which is a 10K around Ford Island, and back to Richardson Field.I was having a discussion earlier this year with a friend who has done his fair share of races, and he told me the Ford Island run was one of the most boring courses for him. I’m the opposite. It’s actually one of my favorite runs. I find the course to be scenic. True, a lot of times you’re just running past military housing, but if you look beyond, you can see the twin towers that mark the edge of Pearl City, mountains in Aiea, and there are sometimes ships docked nearby.. I enjoy it, but it’s not for everyone. I did hear a couple complaining this year while I was jogging near them. They had a stroller so they had to stage themselves near the back, and they were pretty upset with the amount of people walking in front of them. I do agree, that many people in Hawaii seem to ignore staging by athletic ability. Many, many people, who never even attempt to run, like to be up near the front of the start line, not realizing this means everyone else has to swerve around them… or perhaps they realize it and don’t care. I’m not sure. Out of politeness, I try to stage myself further back from where I need to be. I do like this run because it welcomes people of all fitness levels, and it’s cool to see families out there doing it. I admire anyone pushing a stroller, because I think my arms would get tired. Some races are more intimidating than others, and this one is good for people of all fitness levels, which makes it more fun. This run also has some of the best swag after the race. There was bottled water, powerade, bananas, sweet bread slices, and yogurt. The bag they gave us at packet pickup, was a lightweight geico backpack. On a happy note, this was my longest run of 2012 so far, due to being injured during the December 2011 marathon. I’m finally done with physical therapy and the multiple issues with my knee, hip, etc. So, I think I’m OK for now. I don’t want to get my hopes too high, however! *knock on wood* I will continue to tread cautiously for now. I snapped this photo while waiting for the run to start. There were so many clouds in the sky. This entry was posted in races, running and tagged 2012 ford island bridge run, ford island, ford island bridge run, hawaii, running. Bookmark the permalink.